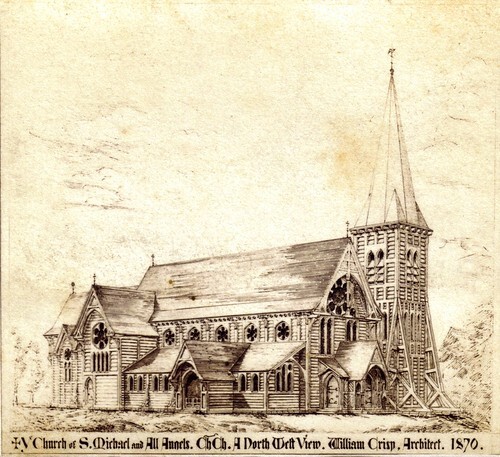 Below is a engraving of Saint Michael and All Angels in Christchurch which I found in our photo collection. It was about one inch by one inch in size and was in a very old photo album with photos from the 1860s and 1870s. This church was a family church for Mrs Sarah Meng (formerly Potts, nee Brown) who the family always called Mrs Potts. She took her three step daughters Mary, Kate and Emma Meng to this church. All three girls were married at the church. Currently some people think that the present day church should be shifted to the site of the Christ Church Cathedral which is currently being demolished due to the Christchurch earthquakes. The drawing states that it was designed by William Crisp, Architect, 1870. This picture shows the North West view. The bell tower on this drawing doesn't look like the present day one. I have found a website which explains that there were problems with the construction and William Crisp handed over supervision of the construction to another architect in 1871 and the building was completed in 1872, two years after this drawing.